A comprehensive Athletics Program is offered to Kindergarten through 8th grade students. Early childhood classes emphasize motor skills, balance, body awareness and hand-eye coordination. Team activities focus on conditioning, health, and sportsmanship. PE classes for our third through 8th grade students include a variety of team exercises and sports. 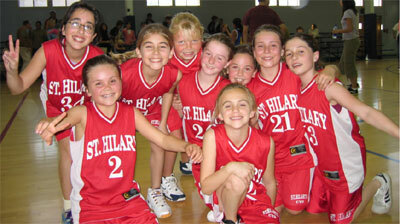 These students can also to join our CYO program where they can compete in a positive team-oriented athletic environment.